If you've read any of my reviews of Willie's Cacao previously, you'll know I'm a big fan of his chocolate, or should I say, cacao. I was in Waitrosesupermarket last week and found these 'chef drops' in the cooking chocolate section. Packaged, oh so beautifully, and titled so aptly, I couldn't resist, and went straight to the till to pay £3.90 for these wonderful 'drops'. As usual with all of Willie's Cacao, the product is wrapped in gold foil, signifying the luxury in my opinion and protecting the precious chocolate. Once I got home I thought I'd better work out how to use these drops, so I warmed some milk, added a little sugar, cinnamon and five drops of these intense blobs of chocolate. Within 2 minutes of gentle stirring the chocolate had melted and I was left with a dark, incredible-smelling, pan of hot chocolate. It was delicious to drink, but also quite strong, so I added a little more milk to pare down the flavour. They're the perfect, cacao 'real' version, if you will, of chocolate chips. Instead of chips, this natural cacao is intense, so if you're tempted to make chocolate chip cookies, these are great. They hold their own when baked, just like chocolate chips, but have a more intense flavour. In short, they're fantastic. 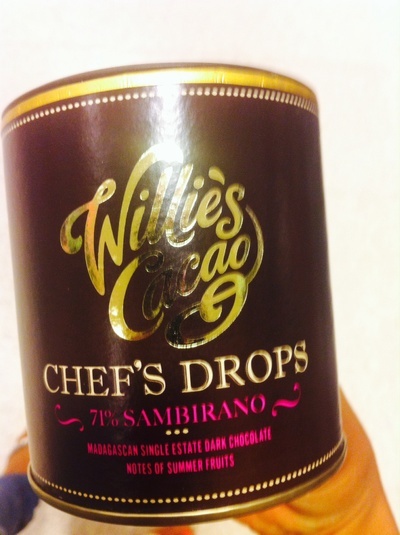 On the Willie's Cacao website they're priced at £5.99, but you can buy this little pot of yumminess in Waitrose for a little cheaper, like I did.